Creamy Chicken Mushroom Pasta combines garlic, onions, mushrooms and chicken in an easy perfectly seasoned cream sauce that comes together in a matter of minutes. You can serve over pasta or rice. This delicious dish comes together in about twenty minutes and is a family favorite. This is one of hubbys favorite meals and I love it because it comes together so quickly! Life is a busy! That is for sure. No matter what time of year it is there always seems to be twenty things going on. I guess if things were not that way we would be board out of our gourd and probably get into some kind of mischief. What is a baked rotisserie chicken and where can I purchase one? This delectable twenty minute Chicken Mushroom Pasta is a cinch to bring together utilizing already baked rotisserie chicken. These perfectly baked rotisseries chickens are available in so many stores now. Competition is a beautiful thing. Costco’s baked chickens are absolutely delicious and priced so well that I do not think I could buy it and cook it for that price. They are also available at all of my local grocery stores and Walmarts. 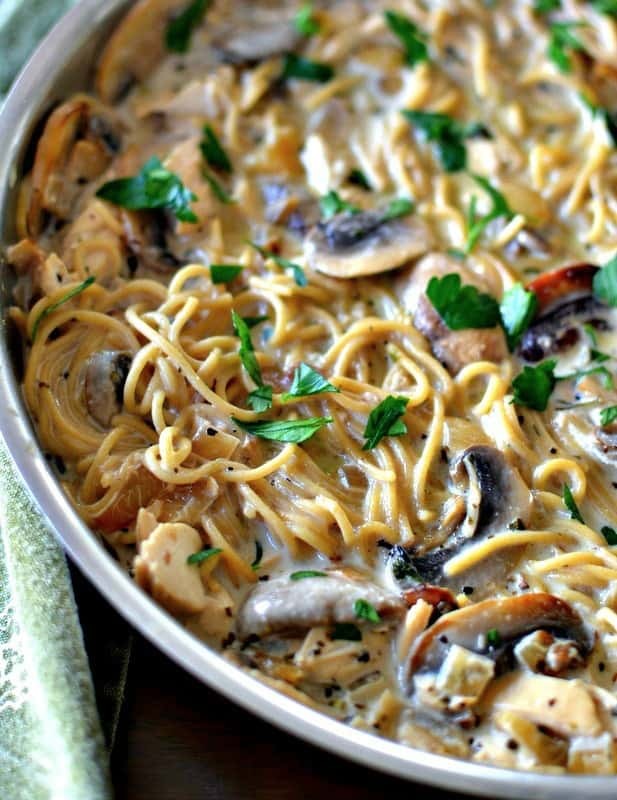 How to make creamy Chicken Mushroom Pasta. In large skillet over medium high heat melt the butter. As soon as it melts add the onions and the mushrooms and cook until the mushrooms are lightly browned. Reduce the heat to low and add the basil, oregano, onion powder and garlic. Add the wine and simmer for a couple of minutes. Add the cream, Worcestershire sauce and simmer to desired thickness. Stir in the cooked chicken and chopped parsley. Add the salt and pepper to taste. Serve over cooked pasta or rice and garnish with remaining parsley. 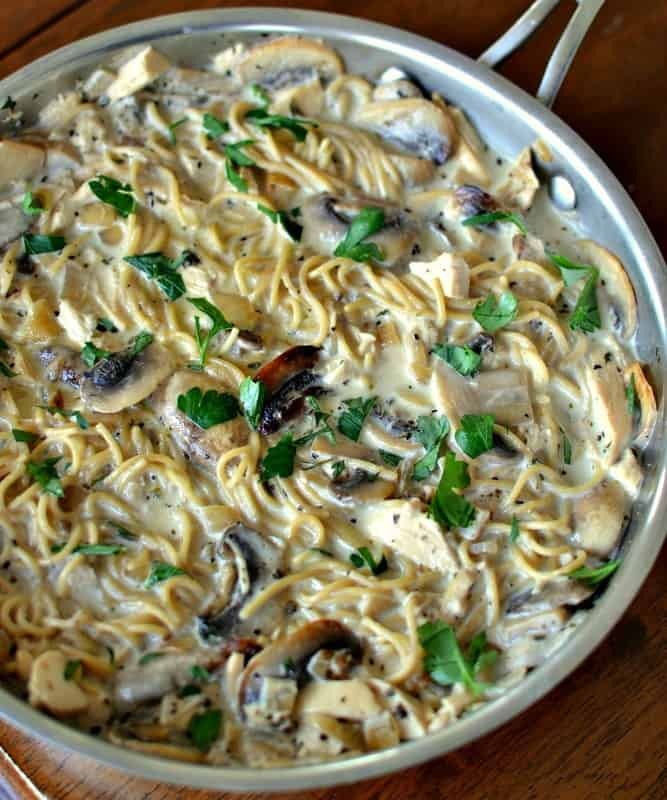 Additions to creamy Chicken Mushroom Pasta! A couple pinches of cayenne pepper or sriracha added with the other spices. Diced red bell peppers added when the mushrooms are almost browned. Is your time short but you love home cooked meals that you can feel good about eating and feeding your family? 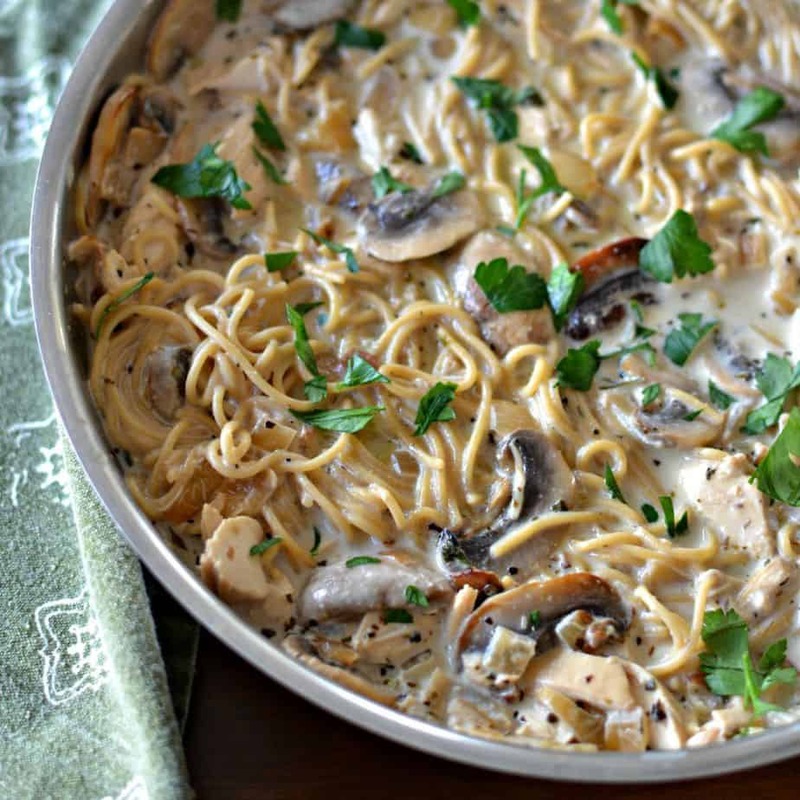 Put this creamy Chicken Mushroom Pasta on your to try list today. Your family will be singing your praises and you will have more time for the other things on your list. This post was originally published January 5, 2018 and republished November 5, 2018 with new content. 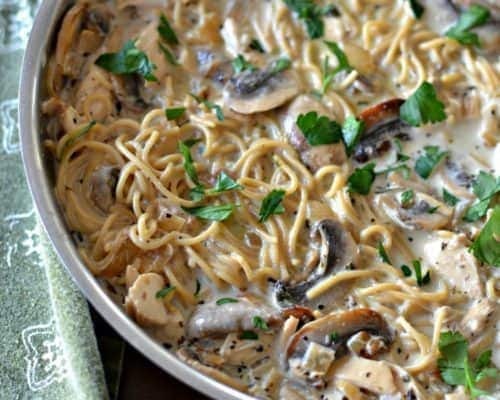 Creamy Chicken Mushroom Pasta combines garlic, onions, mushrooms and chicken in an easy perfectly seasoned cream sauce that come together quickly. In large skillet over medium high heat melt butter. Stay close as you do not want the butter to burn. As soon as it melts add onions and mushrooms and cook until mushrooms are lightly browned; about 5-7 minutes. Reduce heat to low and add basil, oregano, onion powder and garlic; cook for 1 minute stirring continuously. Add wine and simmer for 1-2 minutes. Add cream and Worcestershire sauce and simmer to desired thickness; about 10 minutes. Make sure you keep the heat on a low simmer as cream can burn. Stir in cooked chicken and 1 tablespoon chopped parsley. Salt and pepper to taste. Serve over cooked pasta or rice and garnish with remaining parsley. You can substitute 1/4 cup of chicken broth for the wine but cook for several minutes so it reduces. Do not add pasta or rice till you are ready to serve as they have a way of soaking up the sauce. SO easy and absolutely delicious!! I’ll be making this again soon!! This is my kind of meal! YUM!